Canada West or Upper Canada, 1855. Before treatment. One of our favourite types of items to work on at Book and Paper Conservation Services is rare and antique maps. They are always fascinating from a historical perspective, and they tend to respond very well to conservation treatment. Typical problems for 18th and 19th century maps include staining and foxing; creases, tears and breaks to fragile paper; and overall darkening and discolouration. The colouring can be faded but treatments that brighten the overall paper tone will make the hand coloured areas stand out more vibrantly after conservation. Adhesive on the map had discoloured to a dark brown, and attempts at removal had caused it to tear. This beautiful hand-coloured map, titled Map of Upper Canada or Canada West, and dated 1855, came to BPCS adhered to the inside cover of a volume to which it didn't belong. While the map was originally issued as a fold-out plate in a book, at some point it had been removed from its home and adhered very roughly into the front of another volume. The adhesive the new owner used had darkened dramatically over time, and a rough attempt at removal had caused the paper to tear. Washing the map to reduce overall discolouration and staining. First, the map was tested to determine if the hand colouring was able to withstand aqueous treatment. 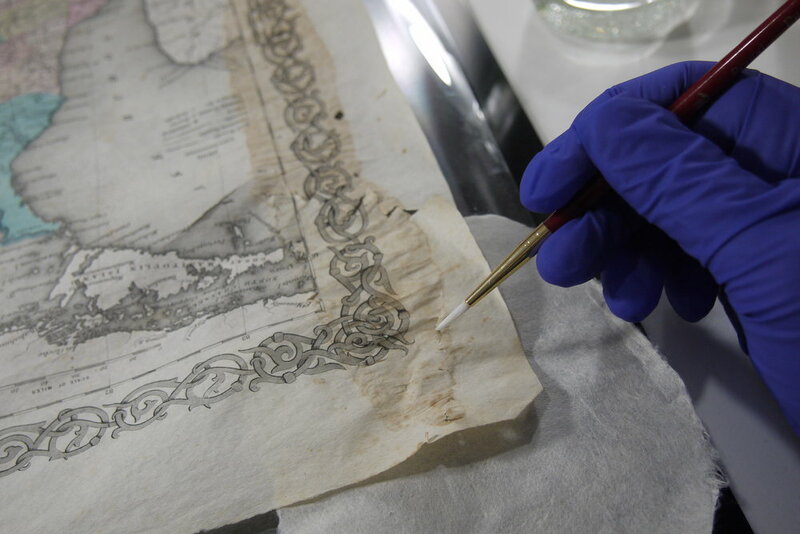 Then, conservation treatment involved carefully removing the map from the book cover, washing the map overall, and performing local chemical bleach treatment on both the large adhesive stain and the other various spots over the sheet. Finally, the tears were repaired and the map flattened. Chemical bleaching through suction to reduce staining. As the map's original book was no longer present, it will be matted and mounted for display as an individual piece. The treatment was very successful, brightening the paper tone overall and reducing the dramatic brown stains that had disfigured the page. It can now be properly appreciated the way it was intended to appear. Canada West or Upper Canada, 1855. After treatment. Newer PostWhat was the first book that got you hooked on rare books and collecting?